WASHINGTON — The Japanese American Citizens League (JACL), in partnership with OCA National (Organization of Chinese Americans), hosted a successful JACL/OCA D.C. Leadership Summit from March 10 to 13 in the nation’s capital. 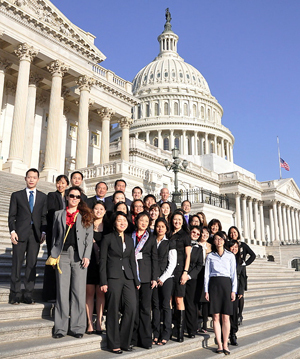 The summit brought in 30 members of JACL and OCA to attend a three-day intensive training. Participants enhanced their leadership and coalition-building skills by becoming familiar with the political process while learning critical issues that affect the Asian American Pacific Islander (AAPI) community. They met with leaders in Congress and the Obama Administration, as well as partners from the social justice community. Summit participants pose in front of the U.S. Capitol Building. JACL and OCA expressed gratitude for State Farm’s generous support of the summit. The JACL and OCA were honored to have a number of distinguished guests speak at the summit, including U.S. Sen. Daniel Inouye of Hawaii; Tina Tchen, chief of staff, Office of the First Lady; Mark Keam, 39th District delegate, Virginia House of Delegates; and Bruce Yamashita, former Marine Corps officer.